Biggie Smalls said, “Mo Money Mo Problems.” If that’s the case, UFC lightweight Nate Diaz (pictured) wants Brink’s to back up their truck and dump a boatload of problems into his meager bank account. Once again, Diaz is upset with the lack of zeroes on his current contract, and, once again, UFC president Dana White couldn’t care less. Diaz has been quiet since requesting to be released from the UFC via Twitter in February. He made up for lost time Tuesday by going on an extended rant with MMAFighting. Diaz is just three bouts into an eight-fight contract extension, but claims UFC brass duped him into inking the deal in late 2012 by giving him an immediate lightweight title shot and promising he could renegotiate his contract whenever he wanted. Diaz says he currently gets paid $60,000 to show and doubles that amount if he’s victorious. The 28-year-old, who claims he’s “broke” and owes the IRS an undisclosed amount in back taxes, has only won once since signing his new contract. In response to Diaz’s demands, White pretty much took the too-bad-so-sad approach. Diaz’s boss suggests he gets back in the octagon because he earns nothing sitting the sidelines complaining. 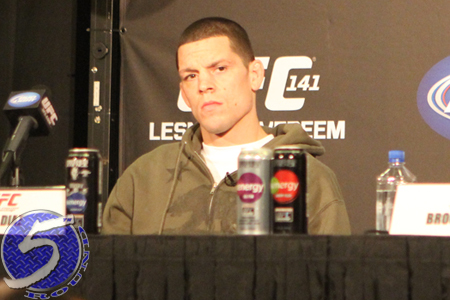 “Nate Diaz came in and signed a new deal and was very happy with his new deal,” White responded. “We gave him a shot at the title and he lost to Benson Henderson. If he would have won, obviously his deal would have changed if he became champion, which he did not. Then he got stopped by [Josh] Thomson. Thomson finished him. “Now he comes off a win over Gray Maynard and feels like he should be making Justin Bieber money. Nate needs to get back in there and start fighting, win fights again and earn a title shot again. It makes sense in the 209, Dana. Clearly, Diaz caught wind of what the UFC gave his homie Melendez in his new deal and wants something similar. The only problem there is, Melendez was a restricted free agent when he stood up to the man and nearly bolted for Bellator. Should fighters get paid more? Yes. But it’s easy for me to spend the UFC’s money. Regardless, Uncle Sam doesn’t play so Diaz better get back in the cage and settle that debt before he’s fighting for his life behind a different fence.